Trastuzumab may lead to serious heart problems, including heart failure. The risk of heart problems is increased if you also use an anthracycline (e.g., doxorubicin). Your doctor may need to stop this medication if heart problems occur. Trastuzumab use may sometimes result in a serious reaction to the IV infusion with serious lung problems. If these problems occur, they usually happen while the drug is being given or within 24 hours of the dose. If you have trouble breathing or severe dizziness/fainting, tell your doctor or pharmacist right away because your IV infusion may need to be stopped. Trastuzumab can cause serious (possibly fatal) harm to an unborn baby if used during pregnancy. Discuss reliable forms of birth control with your doctor. 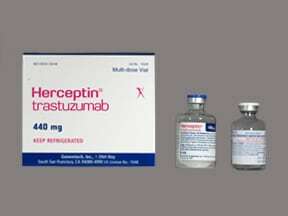 Who should not take Herceptin Vial? Trastuzumab is used alone or with other medications to treat certain types of breast cancer. It is also used along with other medications to treat certain types of stomach cancer. The types of cancers trastuzumab is used to treat are tumors that produce more than the normal amount of a certain substance called HER2 protein. This medication is called a monoclonal antibody. It works by attaching to the HER2 cancer cells and blocking them from dividing and growing. It may also destroy the cancer cells or signal the body (immune system) to destroy the cancer cells. Trastuzumab is not the same as trastuzumab emtansine or ado-trastuzumab emtansine. Do not substitute trastuzumab emtansine or ado-trastuzumab emtansine for trastuzumab. This medication is given by slow injection into a vein by a health care professional, usually once every week or once every 3 weeks. The first injection is given over at least 90 minutes. The dosage is based on your medical condition, response to treatment, body weight, and other medications you may be taking. Be sure to tell your doctor and pharmacist about all the products you use (including prescription drugs, nonprescription drugs, and herbal products). To get the most benefit from this medication, do not miss any doses. To help you remember, mark the days on the calendar when you need to receive the medication. Your doctor may prescribe other medications (e.g., acetaminophen, diphenhydramine) for you to take before the start of your treatment to help prevent serious side effects. What conditions does Herceptin Vial treat? Diarrhea, redness/irritation at injection (IV) site, muscle/joint/back pain, stomach/abdominal pain, trouble sleeping, nausea, vomiting, mouth sores, and loss of appetite may occur. Nausea and vomiting can be severe. In some cases, your doctor may prescribe medication to prevent or relieve nausea and vomiting. Eating several small meals, not eating before treatment, or limiting activity may help lessen some of these effects. If these effects persist or worsen, tell your doctor or pharmacist promptly. Tell your doctor right away if you have any serious side effects, including: bone pain, increased coughing, swelling of the hands/ankles/feet, sudden unexplained weight gain, unusual tiredness, severe headache, tingling/numbness (e.g., in the hands, feet, leg), mental/mood changes, fast/pounding heartbeat, easy bruising/bleeding. Get medical help right away if you have any very serious side effects, including: weakness on one side of the body, slurred speech, vision changes, confusion. This medication can lower the body's ability to fight an infection. Tell your doctor promptly if you develop any signs of an infection such as fever, chills, or persistent sore throat. Trastuzumab can commonly cause a rash that is usually not serious. However, you may not be able to tell it apart from a rare rash that could be a sign of a severe reaction. Therefore, tell your doctor right away if you develop any rash. List Herceptin Vial side effects by likelihood and severity. Before using trastuzumab, tell your doctor or pharmacist if you are allergic to it; or to other mouse protein medications; or if you have any other allergies. This product may contain inactive ingredients (such as benzyl alcohol), which can cause allergic reactions or other problems. Talk to your pharmacist for more details. Before using this medication, tell your doctor or pharmacist your medical history, especially of: previous cancer treatments (including radiation therapy to the chest), current infection, virus infection with returning symptoms (e.g., herpes, shingles), heart disease, high blood pressure, lung problems, previous severe reaction to monoclonal antibody treatment. Trastuzumab can make you more likely to get infections or may worsen any current infections. Therefore, wash your hands well to prevent the spread of infection. Avoid contact with people who have infections that may spread to others (such as chickenpox, measles, flu). Consult your doctor if you have been exposed to an infection or for more details. Caution is advised when using this drug in the elderly because they may be at greater risk for heart problems (e.g., heart failure). Tell your doctor if you are pregnant or plan to become pregnant. You should not become pregnant while using trastuzumab. Trastuzumab may harm an unborn baby. Ask about reliable forms of birth control while using this medication and for 7 months after stopping treatment. If you become pregnant, talk to your doctor right away about the risks and benefits of this medication. It is unknown if this drug passes into breast milk. Consult your doctor before breast-feeding while using this medication and for 7 months after stopping treatment. What should I know regarding pregnancy, nursing and administering Herceptin Vial to children or the elderly? If you will be using an anthracycline (such as doxorubicin) after stopping trastuzumab treatment, if possible, wait at least 7 months. Does Herceptin Vial interact with other medications? Lab and/or medical tests (such as heart exams, complete blood count) should be done before you start using this medication and while you are using it. In women, a pregnancy test may also be done before starting treatment. Keep all medical and lab appointments. Not applicable. This medication is given in a clinic and will not be stored at home.Information last revised May 2017. Copyright(c) 2017 First Databank, Inc.
Are you taking Herceptin Vial? Are you considering switching to Herceptin Vial? How long have you been taking Herceptin Vial?